Useful information on caring for pets in Vietnam. You’re taking your dogs to Vietnam???!!!?? Hippocratic Pet Oath in Vietnam? People, please listen up… there are times when a veterinarian cannot save the life of your beloved pet. No matter how much they try, how much they live up to the “Veterinarian’s Oath”, veterinarians often lose their patients. It is part of the natural life death dance. And the fact that veterinarians are mortal… human. The vets I know and have worked with, the ones that truly love animals like Dr. Nghia, a veterinarian in Saigon, are heartbroken after trying everything to save them. Truly devastated. They empathize with their patients and often cry alongside the pet owners. DID YOU TAKE CARE OF YOUR PET THE BEST YOU COULD? What’s often unfair is when a patient blames a veterinarian for the loss of their pet, as if the veterinarian purposely ignored “The Oath”. There was a recent case where a pet owner placed full blame on the veterinarian even though the dog had cancer for years and had a visible tumor growth on its side. When asked, “why did you not bring your dog in sooner?”, the answer, “I still wanted to breed the dog!” Where is the responsible pet accountability here? How about being more responsible about the health of your dog or cat? If you take your dog in with Stage 5 cancer, please don’t expect a miracle. Wake up people, if you take better care of your pets and don’t wait until your pet’s on death’s doorstep to seek help then please remember you may be pointing one finger at the vet, but there’s three fingers pointing back at you! What I find appalling here in Vietnam is that some pet owners actually demand a large settlement if a veterinarian cannot save the life of their dog or cat. Imagine storming into your vet’s clinic back home with all your family members (minus the pitchforks) and demanding the clinic pay, “or the vet will pay”… seriously??? While I am on the subject of wrongful behavior, these same people demanding a big settlement were the same people bargaining down the dog’s operation as if they were haggling over a bag of mangosteens at Ben Tanh market. So let me get this straight, your dog is not worth the operation but becomes priceless and requires some kind of “wrongful death payment” upon its passing? Incredible! I know Vietnam is still a very young pet culture. The concept of veterinarians is as strange as Heinz ketchup next to the nuoc mam sauce. But, good veterinarians are hard to find in Vietnam. Especially ones trained in small companion animal medicine. So don’t be surprised that a visit to a a top qualified vet in Saigon or Hanoi will cost more than those dingy, sketchy “thầy thuốc thú y” you see next to a pho stand or xe-om repair shop. All veterinarians are human, they cannot always save the life of your beloved pet. James Herriot said it best, “I hope to make people realize how totally helpless animals are, how dependent on us, trusting as a child they are, that we will be kind and take care of their needs.. (They) are an obligation put on us, a responsibility we have no right to neglect, nor to violate by cruelty.” Or ignorance! Looking to buy a pure-breed dog or cat? Avoid District 10 in Ho Chi Minh City at ALL costs! 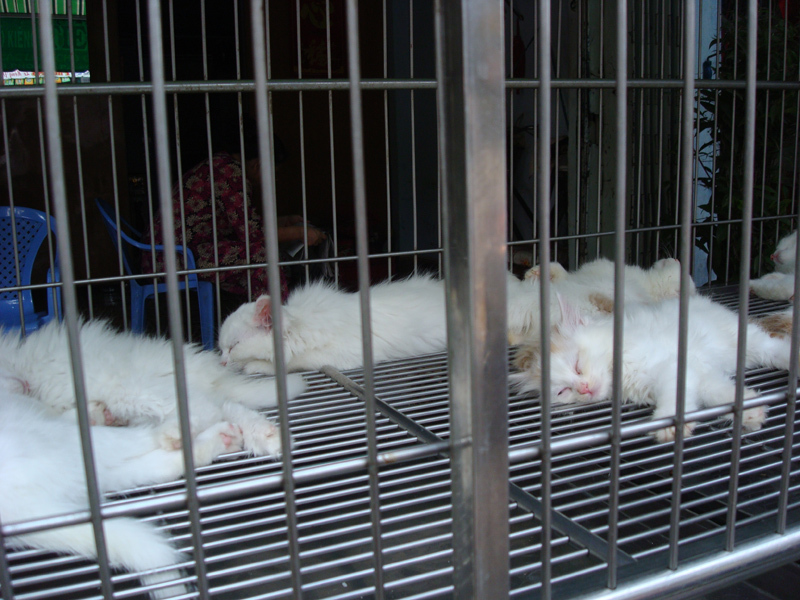 90% of pets bought at this market end up dead. Why? Uneducated and greedy breeders simply looking for a quick profit. Puppies and kittens are NOT vaccinated, not given water and left in the sun all day. Animals that appear to be sick are given shots of steroid to boost their activity level (steroid suppresses immune systems, making it much easier for animals to contract an illness). 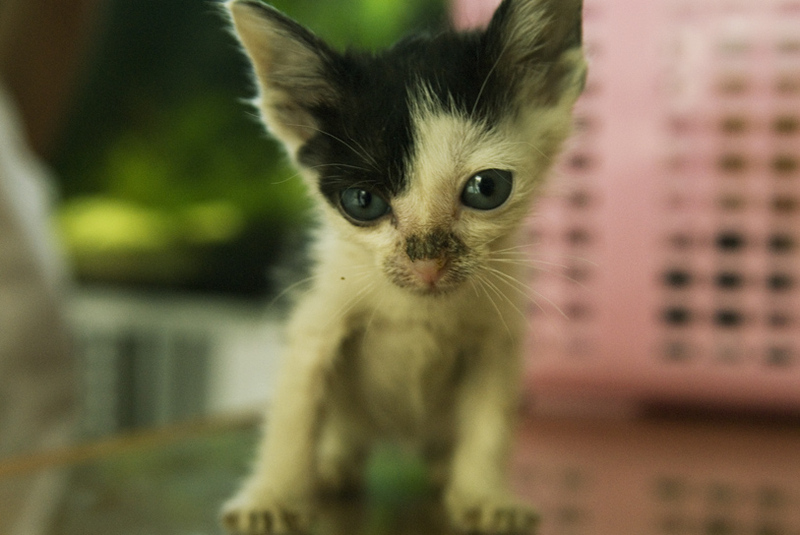 Those puppies and kittens that are too ill to be sold are thrown into a plastic bag and dumped in the trash. When veterinarian, Dr. Nghia of Saigon Pet approached breeders in D10 with an affordable vaccine program they cursed and chased him away. The stench of ignorance and greed at this pet market is greater than the waste product of the animals. As I walked among the wire cages, set out under Saigon’s blazing sun, I couldn’t help but notice how weak and sick the puppies appeared. When I bent down for closer inspection, the breeder jabbed the puppy with a stick to make it seem more alert. When a potential buyer inquired after a small Dalmatian in the cage, the breeder grabbed the dog by one leg and lifted the yelping puppy from its wire prison. There seems to be little one can do to stop the suffering and pain these animals endure. Aside from not buying and fueling the demand for these pets, there is little recourse. ARC Vietnam is currently looking into the matter to see what they can do to help. Initial thinking is to offer vaccines for a lower cost. Currently, basic combo vaccines start at 300,000 ($15USD). A puppy at 400,000 ($20USD). Clearly, vaccinations cut into the breeder’s bottom-line. Not only is D10 a deplorable pet market, but a market to find stolen pets. On approach, I was asked if I wanted to buy a pet or if I was looking for a kidnapped pet. I played along and said I was looking for Lucy, my white-long haired Turkish Angora. I described the cat in great detail. A woman sitting nearby quickly jumped up from her plastic chair and said, “yes we have. we found your cat in Thao Dien!” The woman disappeared for about twenty minutes and returned with a white-haired cat. “Here your cat!” What she didn’t know is that I do not own cats. Her ruse was pathetic. I wondered who the cat truly belonged to! 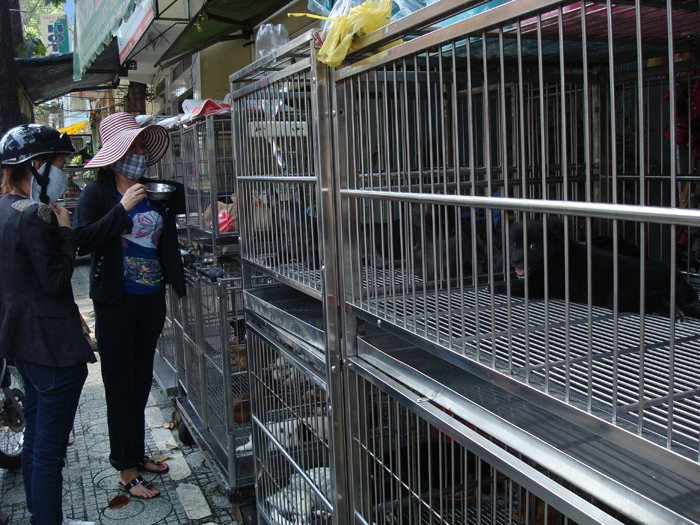 Sadly, as Vietnam continues to emerge and grow, so will the demand for pets. Irresponsible and abhorrent breeders will continue treating animals in a disgusting and inhumane manner if nothing is done to stop. Government support of ARC’s education and low-cost vaccine initiatives might be the only thing that will change these death row dog and cat breeders. Americans now spend $41 billion a year on their pets—more than the gross domestic product of all but 64 countries in the world. That’s double the amount shelled out on pets a decade ago, with annual spending expected to hit $52 billion in the next two years, according to Packaged Facts, a consumer research company based in Rockville, Md. 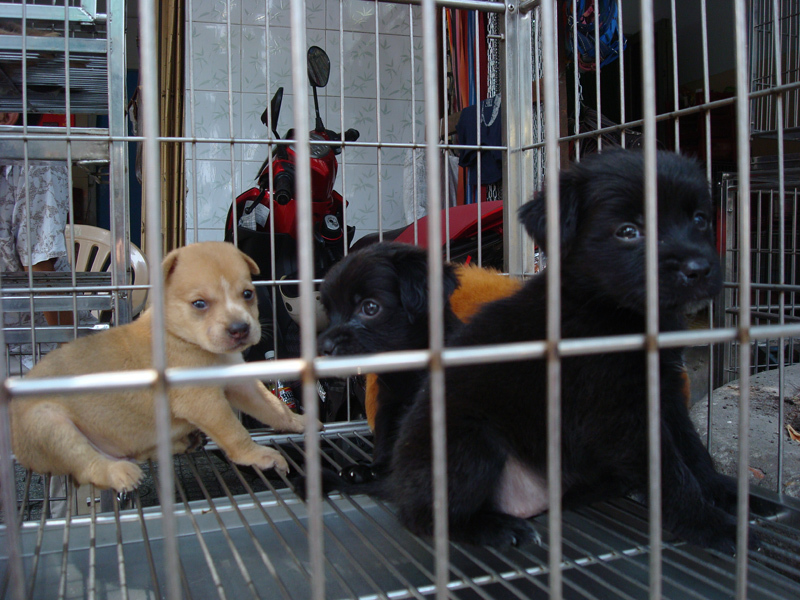 Although Vietnam is nowhere near that type of stratospheric spending, Vietnamese have begun to spend more of their disposable income on pets. As incomes climb and the country continues to develop and build a modern cityscape, more and more Vietnamese are welcoming four-legged friends into their family circle. The demand for pets like dogs and cats has increased significantly in the last ten years. No longer just bought as food or means of protection, these domesticated animals are becoming a status of wealth, a symbol of prosperity. Veterinarians like Dr. Nguyen Van Nghia has seen a significant growth in pet ownership since his return from obtaining his PhD and Post Doctorate at the Bristol University School of Veterinary Science. Vietnam Pets spent a dog’s day afternoon with Dr. Nghia, the Dr. Doolittle of Vietnam, to discuss the past, present and future of pet welfare. Why did you decide to follow a less traditional path and become a veterinarian for “small animals”? I always loved animals as a child. Anytime I saw an animal hurt or abused I would bring it home and take care of it. But back then I feel I did more harm than good because I didn’t know what I was doing. Loving an animal is not sufficient enough to keep it alive. I can thank my mother who allowed me to bring home so many animals and directing me towards becoming a veterinarian. She suggested I follow my heart and do what I love, which is helping animals and educating others about them. As a leading veterinarian in Vietnam, how do you plan to be “the change you want to see in the world”? I would like to see more public education on animal welfare. In Vietnam, the universities only focus on breeding and slaughtering, an agricultural practice commonly called Animal Husbandry. My mission in life is to raise public interest and knowledge on animal welfare. There are widespread implications for the way in which animals are treated, used and included in society. I would like to create programs, which provides people, from children to adults with basic information on pet care. My motto: The cheapest medicine in the world is water. If only more people with pets knew this, we could increase the lifespan on animals throughout the country. Currently, I am working to organize a welfare organization for animals, for both domesticated and wild animals. I’d like to call it “Animal Protection Office” to educate the community on animal care. I receive little support from Vietnam in general. Most people think I am doing something very luxurious, they don’t see my veterinary practice which predominately deals with only small animals, as a necessity but a rather frivolous endeavor. How has pet ownership in Vietnam changed in the last few years? I am seeing more and more Vietnamese bringing their pets to the clinic, especially dogs and cats. Before I would mainly treat the pets of the Expat community but now, as the outside world influences our cultural beliefs and as our society gets wealthier, I see a shift in my clientele, one that is becoming more Vietnamese. In addition, 10 years ago, we didn’t have x-ray machines or we didn’t run blood tests on small animals but Vietnam is changing fast. We are giving out more and more vaccinations and neutering/spaying pets. Besides being revered as the “cat whisperer” in the community, what do you love about your job? The Best Veterinarians in Vietnam? BECOME A VETERINARIAN IN ONLY SIX-MONTHS! 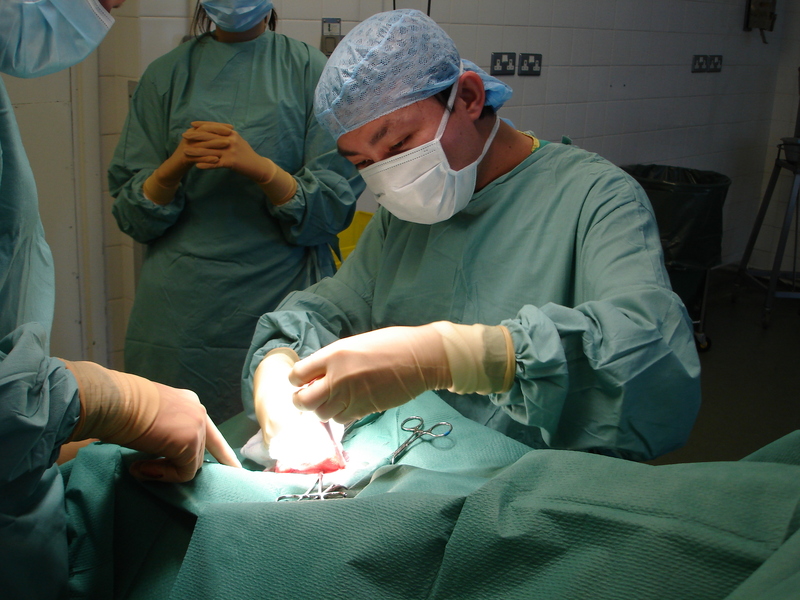 Did you know that anyone can become a licensed veterinarian in Vietnam in only 6 short months! 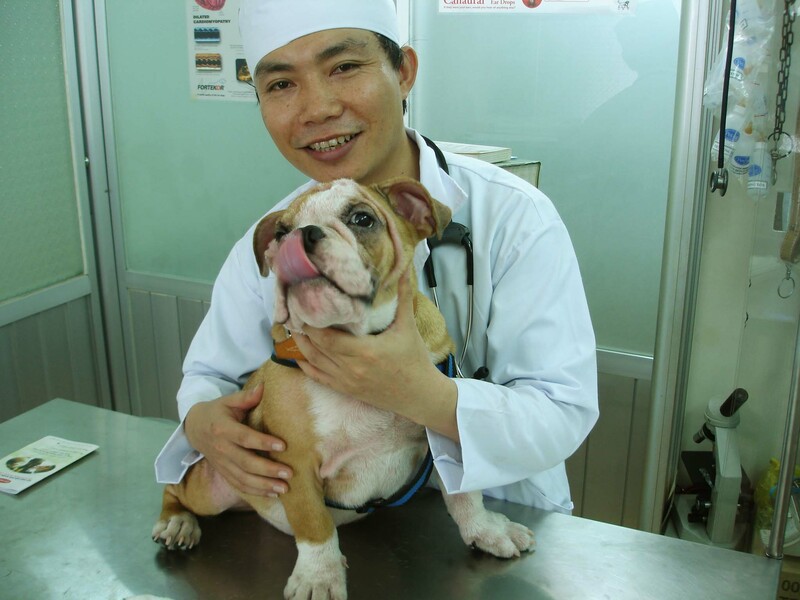 In other countries, it takes anywhere from 5-8 years to become a certified, licensed veterinarian. But in Vietnam anyone can start practicing in a very short time. Sure, the Universities offer 2-5 year programs but many take the easy and shorter route to becoming an “animal doctor”. In addition to the short time it can take to receive a “diploma”, not one course at the Universities focus on teaching health and treatment of small breed animals (i.e., dogs, cats, hamsters, birds, etc.). All courses are geared to teaching large animal care, those animals found on farms. The main focus of the schools is to teach animal husbandry, the agricultural practice of breeding and raising livestock. Students walk away knowing how to neuter, raise and slaughter livestock. Nowadays it is easy to get information on a vet by doing a Google search. Just type in the vet’s name or clinic’s name and see what people are saying about that person or place. Is it good? Is it bad? Check out Facebook. Does the vet have a Fan Page? Or is the vet affiliated with any animal rescue programs? In addition, visit Expat forums like So Saigon or The New Hanoian and read the reviews people have posted on a particular vet or clinic. Beware of Vet Posting Lastly, ask your neighbors who may have pets, word of mouth is usually quite reliable. 2. IS YOUR VET CERTIFIED FOR SMALL BREED ANIMALS?? Many students bypass the rigorous entrance exams in Vietnam by paying a fee to get into the program. Aside from this fact, if these veterinarians only studied in Vietnam you can be quite certain that their knowledge only covers large breed animals. Vets like Dr. Nghia are teaching students at Nong Lam University about small breed animal care but he is an exception to the rule! Ask your veterinarian about his/her qualification. Has he/she only studied in Vietnam? Vets have known to lie about their qualifications stating they studied abroad like in France. Questioned again, they’ll change their answer and say Japan or Germany. Be wary!! It is easy to fake a diploma here or state that you have oversea experience. But the result of this duplicity is catching up to certain vets as the number of pet fatalities is increasing and word is spreading through online forums, blogs and Facebook status updates. 3. CONCERN FOR THE ANIMAL. A friend of mine in Miami told me that she chose her vet because he always greeted her dog first when she went to his office. Simple though that is, it meant a lot to her that he did that. But don’t be taken in simply by a good bedside manner if your instincts tell you that something is not right. Will your vet’s advice always center on the well-being of the animal? 4. WILLINGNESS TO LISTEN TO, ANSWER QUESTIONS AND TO COMMUNICATE EASILY. As someone who is new to taking care of a pet, you want to feel able to ask your vet anything and have her give you just the right amount of information to help you do your job. 5. LOVE OF ANIMALS. Surprisingly, many people choose to become vets not because they love animals, but simply as a way of making a living. Does your vet have animals at home? Is he/she warm and comfortable around your animals when you bring them to the clinic? Does your vet sponsor or promote any animal rescue groups like A.R.C. Vietnam, Animals Asia, Primate Center? Ask. Ask. Ask. Saigon. Sri Lanka. Singapore. Stockholm. Seattle. ARC (Animal Rescue & Care) members come from all across the globe. We are a diverse group of individuals living in Vietnam with one common passion: a love of animals. 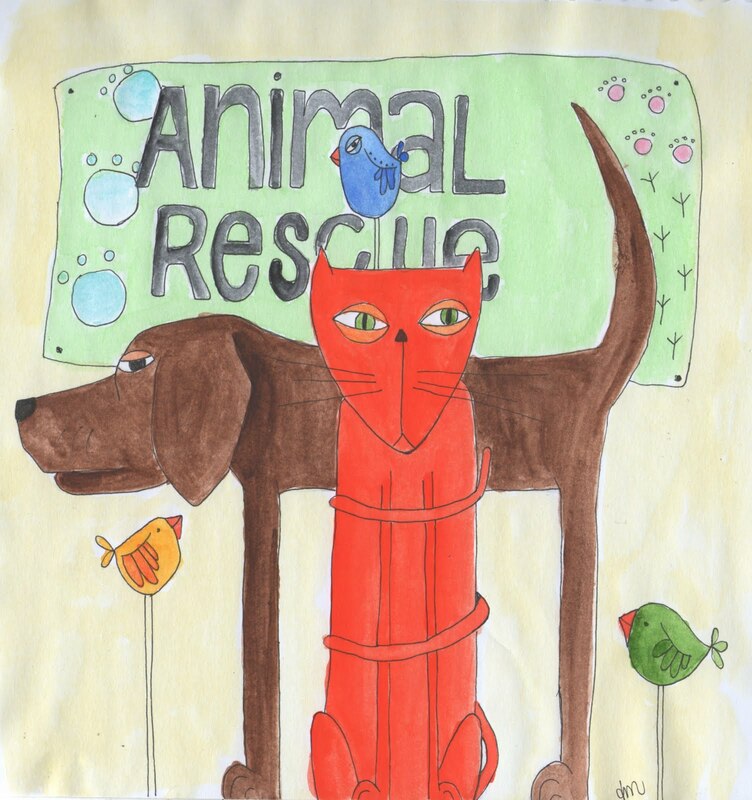 ARC was founded in 2010 to help promote kindness to animals and birds and to prevent cruelty to these creatures. We are a non-profit, non-government organization that receives no government funding; we rely solely on private donations. For more information visit http://www.arcpets.com; email arcpets@gmail.com and become a Fan of A.R.C. Vietnam on Facebook!